I've never quite gotten into the American fascination with the Easter Bunny (separation of church and state, secularism, I get it), it's eggs and rebirth all the way for me baby! 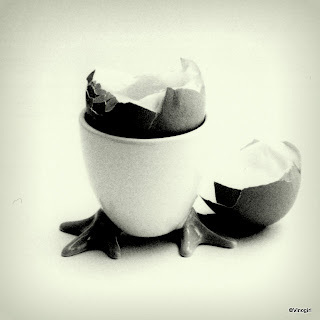 I thought this photograph, which I took for my darkroom class last year, was sufficiently eggie for an Easter post. I did a whole series of photographs using my neighbour's chickens and some other props; egg cup, rosemary, carving knife etc...it turned out a lot less weirder than it sounds, honest. Well, I suppose you would've had to have been there! With Vinomaker's help, I finished tying down the last of the Cabernet Sauvignon canes this morning. That's 'Pruning Season 2013' at an end. Whoo hoo! So in celebration I decided to partake of a relatively leisurely lunch. The rain, that had been forecast for Wednesday past, decided to finally appear and put an end to my alfresco dining plans. Just as well really, as if I'd stayed outside I would have disturbed the fur-gathering, nest-building acrobatics of this Chestnut-backed Chickadee (Poecile rufescens). It was very entertaining to see this industrious, little bird go about the business of feathering, or rather dog-furring, his nest. I brushed V1 three more times during the day and each time my little chickadee cleaned out the dog-brush entirely. Recycling at its finest! Finished pruning the Syrah today, well, the actual cutting bit. I still have a lot of canes to tie down in the Cabernet Sauvignon, as well as the Syrah. Nevertheless, I am relieved to be almost finished, as some of the Syrah vines already have small leaves, not just budbreak. I will have to enlist the help of Vinomaker to tie down the canes that have leaves, as I think double teaming those particular canes is the only way to make sure that none, or at least very few, of the buds are knocked off. No buds, no fruit, no wine. Still, yet another week later. With 3.5 inches of shoot growth and two cute little flower clusters, the Orange Muscat vines are well on their happy, little, fruit-making journey. Next weekend they will need to be sulphured, but unfortunately it is forecast to rain, beginning Wednesday, so I don't know how that's going to work. On a more positive note though, rain means no frost, which for the vines means no frost damage. Of course, being this far along in shoot growth the vines are now producing sugar which acts as a natural anti-freeze. And that concludes my mini series of the progress of the Orange Muscat budbreak. Sorry, no time to blog. As fast as I can prune the Syrah, the buds are bursting that little bit faster. I'm back in work tomorrow. Help! Anyhow, had a great birthday. Vinomaker made the whole day a lot of fun; a couple of wine tastings (in Sonoma), lunch at the Oxbow Public Market (a crab taco), a Kara's Cupcakes passion fruit cupcake (which has become a tradition) and last, but not least, dinner at yet another restaurant we haven't tried before. Tarla Mediterranean Grill, located in the trendy-ish west end of 1st Street, downtown Napa, is a rather small restaurant, but they look like they are currently expanding into the next unit. They need to, people are packed in like sardines - and loud? Yikes! Wine list was a little small, but we settled on a inexpensive imported white, Boutari's Elios, an interesting blend of 50% Moscofilero, 30% Chardonnay (what? ), 10% Roditis and 10% Savatiano. Paired well with my Spanakopita appetiser, not so good with the dolma, but went great with my diver scallops and shrimp entrée (spot a theme here? Crab? Scallops? Shrimp? My birthday happened to fall on a Friday in Lent). Dessert was baklava with vanilla gelato, paired with Bonny Doon's Vinferno, a blend of 51% Grenache blanc and 49% Roussanne (produced using an Amarone-like process)...yum! All yum! Thank you Vinomaker for my busy birthday day. I was pooped at the end of it, but a good pooped. Ta la! Yes, yet again it's my birthday. Whoo hoo! I just love birthdays. Vinomaker has already treated me to a couple of wine-tastings (over in Sonoma), lunch at the Oxbow Public Market (had a crab taco, it's Lent) and, as is now a tradition, a Kara's Cupcakes passion fruit cupcake...yum! Like I said before, hello Syrah! I began pruning the Syrah vines today and, with Vinomaker's help, got two rows of the Cabernet Sauvignon canes tied down. The weather was beautiful, so it was great to be outdoors all day after yesterday's rain. One, rather short, row of Syrah is bilateral cordon trained. Training the Syrah this way was an experiment that worked, or rather didn't. In my opinion, Syrah is too vigorous of a grape variety for bilateral training. Syrah could perhaps be quadrilateral cordon trained (site specific, of course), but head-training seems to favour this the wild child of grape varieties. However, I have to admit that old cordon-trained vines are interesting to look at, as every previous vintage's pruning wounds are more obvious than on the head-trained vines. Band-Aid, anybody? Today I had to take the day off work and drive up to Santa Rosa. Why, one might ask? Because I had to be man-handled by a government employee whilst having my biometrics taken in order to renew my green card. Call me old fashioned, but I think it is rather important that I respect the laws of the country in which I have chosen to reside. In my opinion, it is just bad form to arrive on some foreign shore and expect that one is owed something from one's adopted homeland. La Migra, a name which I am sure conjures up unpleasant thoughts in the minds of quite a large percentage of Napa County residents, has never been a concern to this particular resident alien. I follow the rules. I pay what is requested of me ($450 this time). I periodically subject myself to being finger-printed and photographed. I don't complain. 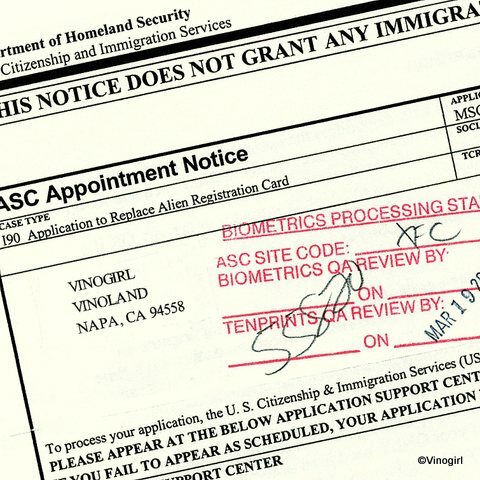 I observe the immigration laws of the United States of America. What is it that some people don't understand about the definition of the word illegal? On another note, I got home early enough to finish pruning the Cabernet Sauvignon vines, though I haven't tied down the canes yet. It is forecast to rain tonight and tomorrow, Napa's first rain for March, so that will help soften the canes up a bit which'll make tying them down a little easier. Then...hello Syrah! ...and it is a bud no more. The Orange Muscat vines are definitely up and running for 2013. When I left for work today, the vines were backlit by the early morning sun which made their youthful, green-fuzziness very obvious. Next week, this same leaf-clusterette will probably have grown up to be a 3 inch shoot. Ah...my babies. Ouch! This looks painful doesn't it? Luckily, I did not need this particular shoot for a spur, or cane. Which is just as well because it really didn't look very viable after I'd finished cutting it from around the fruiting wire. Pruning is going well and I estimate that I may finish the Cabernet Sauvignon tomorrow. Of course, I still have to tie the canes down. Carry on! The folks at Far Niente, who usually perform their vineyard operations like clockwork, seem to be a bit behind this year. Or maybe this spell of warm weather - it reached 80° here on Wednesday - took them by surprise. Whatever the reason, this was how Far Niente's Chardonnay vineyard looked this morning when I walked the Vinodogs. By this afternoon's walk, a pruning crew was busy giving each vine a flattop. Pre-pruned earlier in the winter, these vines are displaying what in plant physiology is known as apical dominance...cool. And I may have mentioned it before, delaying pruning as long as possible can help to retard budbreak which can aid in the avoidance of injury to the new, baby budettes from spring frosts. I expect to hear Far Niente's frost-protection fans strike up, (usually about 3 a.m.), in the not too distant future. This Virginia Opossum (Didelphis virginiana) is going to be extremely tired tonight. For about 4 hours, in broad daylight, V2 had it pinned up a tree. Alerted to this little dilemma, whilst I was trying to have a peaceful afternoon pruning, I wandered over (with my trusty camera, of course) to assess the situation. V2 was patiently waiting for the opossum to come down from it's perch: the opossum was patiently waiting for V2 to vaporise - fat chance of that! My little V2 is one determined poochie, she is like, er, a dog with a bone. Or a dog with an opossum up a tree. V1 is 15 years old today! My old girl turns 15 today. With each passing month she slows down just that little bit more, but she's not exactly what you'd call decrepid. Vinodog 1 still has her 'funny half-hours' when she springs about like a dog half her age, zipping through the shrubbery and glancing back at me now and again, as if she is challenging me to chase her. Of course, she is exhausted afterwards. Sometimes, she forgets what she began barking about and just keeps barking until I distract her with a dog biscuit. And I didn't think it was possible, but she has become even more attached to me: she'll pace about, in a panic and wide-eyed, looking for me if I leave the room. She is a great companion. ...same bud, different angle, but this time there is most definitely little leafy bits sticking out the of aforementioned bud. Tiny teeth, itty-bitty hydathodes, teeny-weeny spongy mesophyll - all unmistakably grapevine leaf tissue. A heartfelt thank you to my mother, my sister and my sister-in-law on this Mothering Sunday. I wish I could be with you all in person, so that I could give each of you the biggest bouquet of spring flowers I could gather...along with my love and gratitude in recognition of a job well done! Happy Mothering Sunday to all (English) mothers. When does a customised cork carry too much information? When there is so much ink one can't even be bothered reading it all! Besides, much of the same information is printed on the back label of the wine bottle. This cork has the most inked information on it of any cork I have ever seen. It's a veritable thesis. As for the wine it was pleasant, but nothing to write home about (except I am indeed writing about it). The Ravines, 2010, Finger Lakes Dry Riesling, was a gift from a friend (the same friend who also gave me and Vinomaker the bottle of Lamoreaux Landing we had both enjoyed so much). This Riesling was not bad; it had some petroleum notes, the acid was so-so...it just wasn't the zippy glass of wine I wanted after a warm afternoon of pruning Cabernet Sauvignon vines. (I started to prune the red grapes yesterday). So I switched to a Sauvignon blanc instead. Much better. I have had, and enjoyed, Miner Family's, Stagecoach Vineyard Cabernet Sauvignon several times before and this their current vintage, 2009, does not disappoint. The nose is typically varietal; the aroma is of black fruit with a hint of mint; the bouquet is of vanilla and miscellaneous spices. Smooth on the palate - with yet more vanilla, a spicy anise vibe and nice acid - this is a rather easy wine to drink. Firm tannins and great structure lend a very pleasant mouthfeel to this wine: it's big and assertive - without stepping on any toes. I must say, Miner do a pretty nice job with all of their wines (except for their current vintage of Viognier which is not very varietal-like). I even like their La Diligence line which is a collaboration between Miner winemaker, Gary Brookman and Rhône producer, François Villand. (A special nod here goes to their Marsanne). I think one of the main reasons I like this wine is that the fruit hails from Stagecoach Vineyards, a thoroughly unique 600 acres high atop the eastern hills of the Napa Valley. I love this vineyard. And if a person can have a favourite vineyard this particular vineyard would be my number one choice. It's been unseasonably warm the past week or so - it reached 73° last Friday - with nary a raindrop in sight. In fact, Napa has just experienced the driest January and February on record. I love it! Apparently the vines do too. The Orange Muscat vines are, like me, enthused about our beautiful winter and have decided it's time to get their skates on for 2013. Though not advanced enough to be considered full-on budbreak, this particular bud is definitely displaying a clear-cut case of bud-swell. At first I thought that the vines were being a little premature due to the warm conditions, but after checking last year's dates I see that the vines are right on track. Still, I just wish my little buddies would behave themselves and calm down. At least just long enough so that I can catch up with their headlong sprint into this growing season. Happy St. David's Day: 2013. Looking back over my February posts, I am surprised at how many 'Happy' related posts there were. Beginning on the 1st of February with a Happy St. Trifon's Day salutation, there were mirthful birthday celebrations and joyous pruning events (I can get very excited about pruning). So why not start the month of March off in a similar vein? I will then. Happy St. David's Day to anyone of Welsh extraction. Hmm, funny, I'm suddenly craving leek soup, paired with a nice Sauvignon blanc. Or a Reisling, perhaps?